Gosh, I’ve had this cake on my minds for ages!!!!! If you follow me on Instagram you know I think about cake like 99.9 % of the time but these flavours I’ve been craving for a long, loooong time. Now that I’ve been eating my weight in summer fruits (I love you summer for spoiling me rotten! ), it’s time to enjoy them in a different ‘form’ . And you know me well, rule number one when it comes to sweet treats – the more fruit, the better. So, just right now, I am sitting on the patio, swinging my bare feet, warming my freckles in the sun (OH!It feels soooo good!) 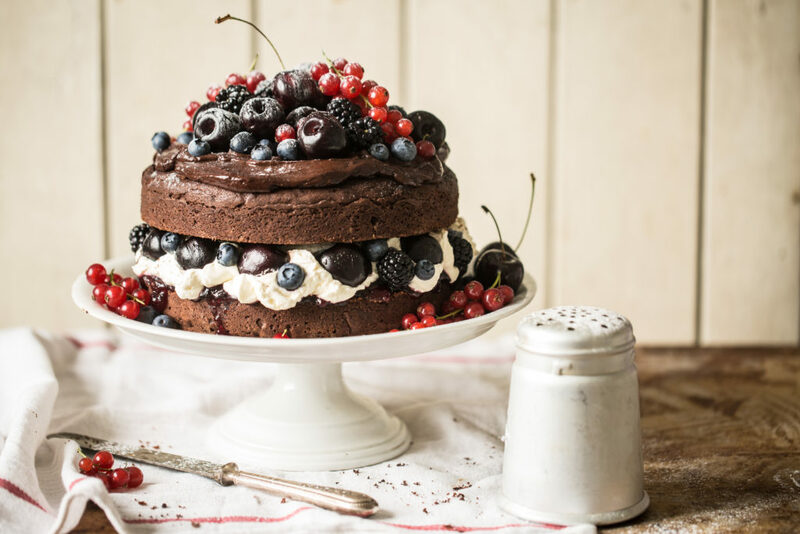 thinking how to describe this cake to you, at the same time I am munching a generous piece for breakfast. (That’s what I call authentic recipe writing lol!). Spoonful one, the rich, chocolatey layer. Spoonful two, the fluffy, delicate cream with a punch of cherry sweetness and a boozy flavour. 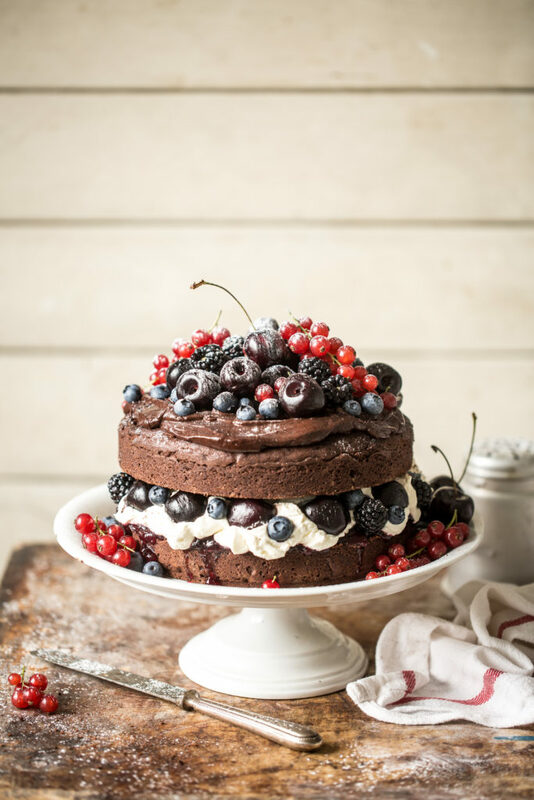 Next spoonful, melting in a mouth chocolate ganache and a spoonful of the flavoursome, bursting with sweetness cherries and all my favourite berries. It’s the cake I want to make my summer memories with. Heat the oven to 190C/fan 170C/gas 5. Butter a 20cm cake tin. In a large bowl, cream the butter with sugar until pale and fluffy. Add the eggs, one at a time, and beat until you get light and fluffy mixture. Beat well to get lots of air into the mixture. Add the cacao powder and mix until combined then add the flour and mix it in with a spoon until combine but don’t over-mix it. Place the mixture in a tin and bake for around 50 minutes, even to one hour. Check it with a wooden skewer. If it comes out clean,it’s ready! Leave it to cool completely and cut the cake into two layers. Draw the line around the cake with a smaller knife and then use a bigger one to slice it. Hold the top of the cake with your one hand and slice with the other. Place the pitted cherries in a saucepan with kirsch and sugar. 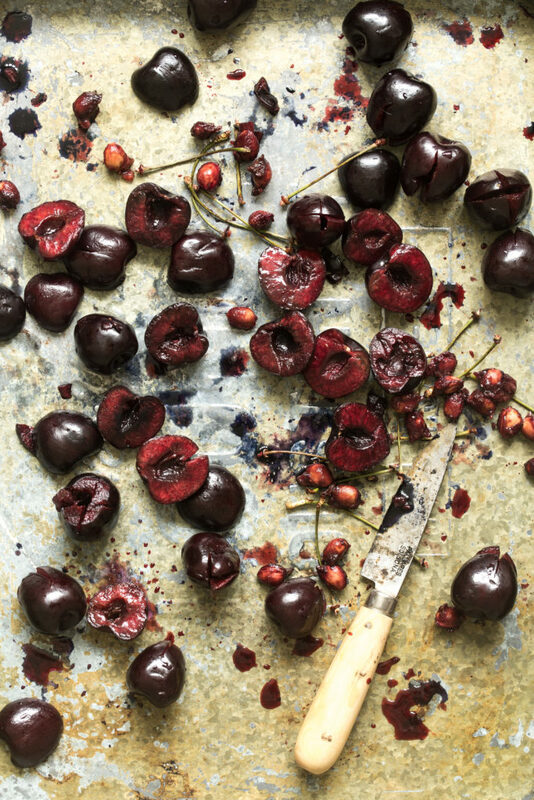 Bring to a light boil and then reduce temperature and simmer for 10 minutes, stirring carefully often, until the cherries have softened but are not mushy. Bring the cream to a light simmer in a saucepan. Once at a simmer, pour the mixture over the chocolate. Leave for 2 minutes, and then stir until smooth and thick. Leave to cool completely at room temperature. Beat the cream with sugar until smooth and creamy. Prick the cakes with a wooden skewers and brush with the liquid reserved from the cherries. 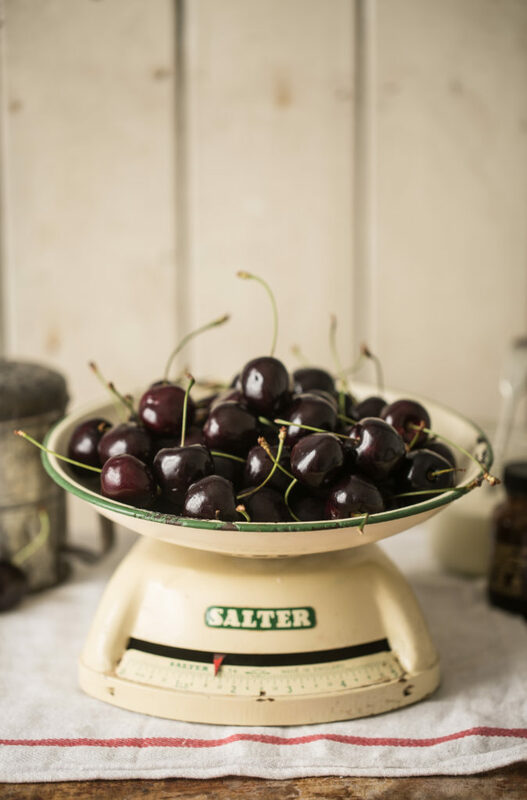 Place the first layer of the cake on a plate or a cake stand, spread a thin layer of the cherry conserve, top it with fresh cream (leaving around 1 cm around the edges, so it doesn’t ooze out when you place the second layer), add cherries and gently press. 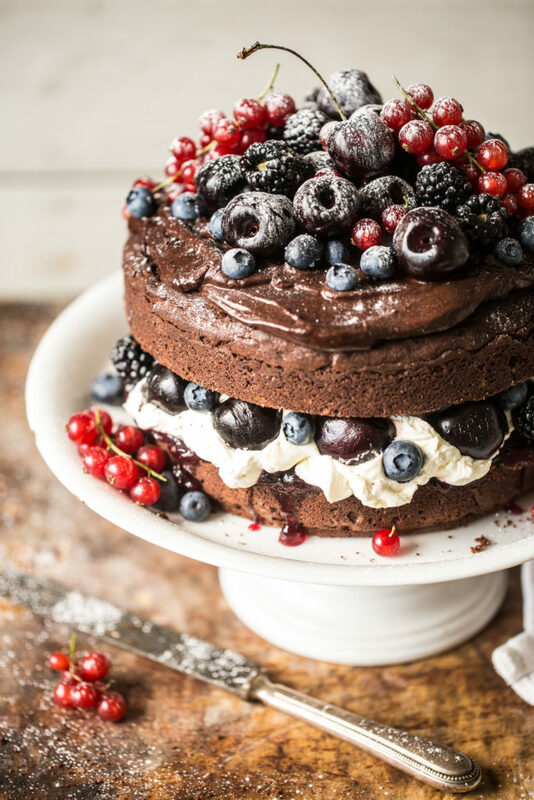 Place the second layer of the cake on top, spread a layer of ganache and top it up with lots of fresh fruit. Sprinkle with icing sugar. It’s best to be enjoyed the same day(how can you resist? ), however if you need to make it in advance, keep it in a fridge but take it out 30min before the serving to allow to stand in a room temperature. This post has been created in partnership with Waitrose but of course all the words and opinions are honest and my own.